Each of my eight immigrant families had the same goal: decrease the distance between themselves and lunch on a daily basis. What courage it must have taken to step onto an ocean going ship in 1848, anticipating icebergs, storms, fifty foot waves and knowing that it might be sixty to ninety days to reach land. In preparation for the fast approaching global village, the rising generations of these eight families, as they jump out of the dull annals of history, where we are their barbarians, and ride across the stage of life in the 21st century with all the valor, gaiety and color of modern times should want to understand from whence they came. "echoing down the wind, blown backwards from the lips of fame"
Reading this means that you were born in the 20th or early in the 21st century and more than any other period in history, we now possess a more dynamic archive of life in our time than ever before. These inventions that enabled this archive are a by-product of the inventive genius of the 20th century, movies, video, sound and photos. The basis for the 20th century achievements actually may have begun earlier, formed by several events and at several different locations at different points in time. In 1870, the Age of Invention established the technological foundation for our society that later on in time allowing the peasants to move off the farm to the cities enabling the beginnings of the industrial revolution. In 1914, The Great War erupted dismantling the 19th century's class and political structures. Forever more, good help would be so hard to find. In 1917, the Russian Revolution established the ideological schism that would define a bipolar world for over seventy two years, eventually forcing the Russian people to choose between the Communism religion and Mother Russia herself. In the 1940s, the spectacular sacrifice of our World War II generation, who alone may have saved the century and perhaps all of mankind. War is a common thread throughout the lives of all our Irish and European ancestors. Military glory was a dream that century after century seized on man's imaginations and set their blood on fire. Trumpets, plumes, chargers, the pomp of war, the excitement of combat, the exultation of victory--the mixture was intoxicating. To command great armies, to perform deeds of valour, to ride victorious through flower-strewn streets, to be heroic, magnificent, famous--such were the visions that danced before men's eyes as they turned eagerly to war throughout our history. In these wars, my Bender family line from Germany lost over 230 Bender ancestors starting in the third partition of Poland and Napoleon's invasion of Russia. War was not a dream for the common man in Europe or Ireland. Many of our ancestors were the foot soldiers of these wars, the stepchildren of valour. War was an aristocratic trade, and military glory reserved for nobles and princes. 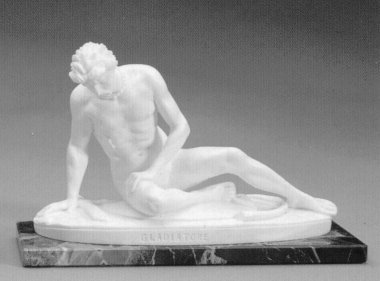 In history, courage was the god of war, called valour by many historians. War was won by valour and was seen as the supreme high adventure. It was a dream that died hard. Century followed century and glittering visions faded before the somber realities of history. Great armies in their pride and splendor were defeated by starvation, pestilence and filth, valour being sacrificed to stupidity, gallantry to corruption. Many times throughout our family's European history one or all of the Four Horseman of the Apocalypse were turned loose on mankind, governments and aristocrats believing to the end that valour was the lock on the gate. "Before me was a white horse! Its rider held a bow, and he was given a crown, and he rode out as a conqueror bent on Conquest. Yet another horse came out, a fiery red one. Its rider was given power to take peace from the earth and to make men slay each other. To him was given a large sword for War. Then a black horse! Its rider was holding a pair of scales in his hand, Pestilence. And theî a pale horse! Its rider was named Death and Hades was following close behind him." To understand our family's history, mere facts can never be enough as you will reprocess what you read through the mills of your imagination. You must merge what you read with what you choose to believe is true, as "truth" is really only your truth. This History of 8 Families may provide a foundation and glinting in it you might see the trace elements of every family on earth. It is certainly not a tabula rasa. The long view is that my generation's most immediate ancestors, our grandparents or our great grandparents were born into three of the five great empires that in their time ruled the known world, British, French and [Hapsberg] Austro-Hungarian: the other two being the Ottoman and the Russian empires. Those empires have been gone for most of our time, since the beginning of the 20th century. 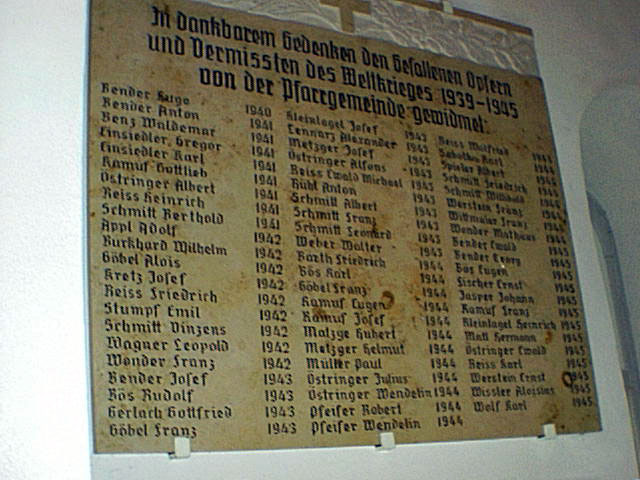 When you read the Bender history and see my grandparent's cousins listed on the wall of St. Nicholas, the Rettigheim village church as being killed in The Great War [photo] or in WW II [photo] history might come alive as you ask yourself, what might have been? Reading about our twelve Bender ancestors that served and were wounded or killed in Napoleon's Army during his invasion of Russia in 1812, one of which made it home to die makes history seem real. When you read the Irish side, can you picture yourself as a twenty five year old young man in the early 1890s sitting on a mud floor in a stone house 11 by 20 feet big, talking with your parents about emigration knowing that you would never see them or the green fields of Ireland again? History does not always reveal its alternatives but implies rather what might have been. Not too many years ago, at the beginning of the 20th century in 1906, the last great caravan of 20,000 camels started on its yearly trip along the Great Salt Road in Africa, about eleven years after my Irish grandparents arrived in America. Salt at that time was worth its weight in gold in that part of the world. A 100 years or so, really wasn't that long ago. As we begin the 21st century, I hope the History of 8 Families may provide the framework on the way back to let you imagine what might have been if our ancestors had chosen a different road to travel, if they hadn't put on strength, Che Dzin. They had only the courage to risk all, grasping at the freedom to better themselves, risking the unknown, the ultimate terror, accepting the age old great rule of all agrarian societies if not all society, once you leave there's no coming home again. After all, a great idea must first break a great rule. Emigration on a grand scale, our ancestor's defining moment was the great idea. There are always two sides to every story. This is . . . . . . . . .
are the men that God made mad. In ancient writings Ireland is called Fail, as in Inis Fail, signifying Insula Fatalis or the Island of Destiny: a name given to Ireland by the Tua-de-Dacans from a remarkable stone called the Lia Fail, signifying Lapis Fatalis, Saxum Fatale or Stone of Destiny. The Lia Fail is believed to be the stone on which Jacob rested: and sitting on which the ancient Irish Kings, the de-Danans and the Milesians were crowned at Tara. This stone was sent to Scotland in the sixth century by the Irish monarch Murcheartach Mor MacEarca for the coronation of his brother Fergus Mor MacEarca, the founder of the Scottish Monarchy. It had been used for many centuries at the coronation of the Scottish Kings and kept at the Abbey of Scone. When King Edward I, [ruled: 1272--1307, called Longshanks, the Hammer of the Scots] invaded Scotland he brought the Stone of Destiny back to England and placed it under the coronation chair in Westminister Abbey where it remained until 1997. Based on a political move by the English Parliament, it was returned to Edinburgh Castle in Scotland. with which he spills his blood. Such an outlook and temperament make for wonderful songs and thrilling stories, but not for personal peace or social harmony in the larger society. This unusual early description of the ultimate human conflict, brother slaying brother, seems much different than the history of other countries but still is Ireland. It may even be the beginnings of a historical explanation of the Irish passion for causes, the necessary springboard and hallmark of all short-lived heroes. Henry II invaded Ireland in 1171. As a result of the Treaty of Windsor in 1175 between Henry II of England and Rory, the Irish High King, Ireland became subject to the English Crown. English kings ruled through the appointment, first of Justicars and later of Lords Deputy and Lords Lieutenants. In 1177, Henry II created his son John, "Dominus Hiberniae" Lord of Ireland, at the same time two Norman's, Robert Fitzstephen and Milo de Cogan were granted the Kingdom of Cork between them. Philip de Braose was granted the Kingdom of Limerick. Later in history, the more famous and much married Henry VIII was the first to use the title King of Ireland. The Irish born rulers of Ireland lasted only 158 years from 1014 until 1172, when Henry II of England was made ruler of Ireland by Pope Adrian IV who was the son of an English priest. Henry II had promised that he would take care of Adrian's family back in England. Pope Adrian IV then issued a Papal Bull called "Laudabiliter" approving Henry II's conquest of Ireland. This meant that Henry II and the English were not to be defied under the penalty of Excommunication. The Irish clergy now had to help the invader and support Henry II all of which was done to save the Irish from themselves. Over time, the English tried various forms of government. One of the earlier forms of government during the English Plantation effort was with English appointed Barons as local rulers. They were to be the extension of the Monarch's rule in remote far off lands like Ireland. These lands usually were never under control and it was left to the newly appointed Baron to bring his new Barony under control for himself and the king. Our Irish and European ancestors grew up in a societal environment that was for the most part decided for them. On the Irish side, our ancestors social and economic standing in Irish society was determined by the existing rulers. These rulers [British Barons] were absolute and had rights far beyond what exist today. The right of gallows as an example, enabled the local Baron to role into town and hang anybody he wanted whenever he wanted. That, along with other less intrusive rights made for a society that was restrictive at best. This absolute rule by English Barons and their Knights lasted for centuries up until the mid 1600s when the Cromwell era began the erosion of this absolute power. Predating the English rule was Ireland's own ancient Gaelic Military Order called the Niadh Nask. Long before the advent of Christianity it provided a warrior elite from the highest ranks of the nobility, which defended both King and State. The sub order of the Niadh Nask for our area was the Clanna Morna, or Knights of Connacht. The order is still in existence and its influence is world wide due to the Flight of the Earls at the beginning of the 1600s and the Flight of the Wild Geese at the end of the seventeenth century. The Earls left from Portnamurry Bay in Co Donegal which is not to far from Co Leitrim. Apparently none of my Irish ancestors belonged to the Niadh Nask or Clanna Morna. Although, in 1377 the doctrine of Barony by Tenure seems to have been accepted, it was nearly a century later before the official creation of the first Irish Baron, that of Baron Trimleston in 1462. Not long afterwards this was followed by the creation of the first Irish Viscount in 1478, Sir Robert Preston (Gormanston). A great Preston home page with an enormous amount of family data on all the Prestons, US, England and Ireland by Fred Preston. Ireland has 331 Baronies in 32 Counties in one country. The Barony of Orhera, County Armagh, Ulster and the Barony of Drumahaire, County Leitrim, Connacht offer two good examples of the typical Irish Barony: Orhera or Drumahaire. The Barony of Orhera's older name being Orier Bar and its current modern name being Orior Lower. Drumahaire's older name being Drumagheire. Drumahaire was known as Slieve Anierin in the very old days, c. 1592. County Leitrim has five Baronies. Here is an example of the line of descent for the Baron of Drumahaire in Co Leitrim and the line of descent for the Baron of Orhera in Co Armagh. This was the overall ruling structure in place in Ireland as the known history of the McTiernans from Sheskin unfolds. Yet another different McTernan Sept is historically based in County Meath. While Meath is no longer a province, it was one of the five provinces in early Irish history. The five provinces were originally seven kingdoms, with the other two kingdoms of Oriel and Ail each merging into Ulster in the 1600s. This McTernan Sept is located in the Barony of Moyfenragh, one of 331 Baronies in Ireland. Meath is not in Connacht, rather it is in Leinster which translates to Territory of Spears. The MacTernans in that area were Chiefs of Teallach Dunchada, the tribe or territory of Donogh. Yet another McTiernan Sept from the north-eastern part of Co Roscommon are descended from Tiernan, grandson of Turlough Mor O'Connor, King of Ireland. As yet, there is no connection between my McTernan family from Sheskin, Barony of Drumahaire, Co Leitrim, Connacht and either of these Septs mentioned here other than the identical surname. The current results of the worldwide McTernan DNA test suggest that there are 20 different MacTighernan Septs or at least 20 different progenitors based on the 20 different, distinct and genetically unrelated DNA Groups. All of Ireland now has four provinces, however back in history, Meath, the mensal land of the Irish Sovereigns was the fifth province. It is called Meath or Midhe because it was formed from the neck of each of the other provinces. Leinster translates to Territory of Spears. Connacht received its name from a trial of magic that took place between two druids of the Tuatha-De-Dannans, whose names were Kithnellach and Conn. Conn won the contest by covering all of Connacht with snow, hence the name Connacht was given to the province. Ulster was called Uladh meaning great treasure, implying great wealth in fish and cows. Munster derives from the Gaelic word Mumba or Mooa to Mo meaning greater. A section of Connacht and Ulster was known as the Kingdom of Bréifne which covers both Co Leitrim and Co Cavan. West Bréifne covers all of Co Leitrim and the two baronies in Co Cavan, Tullyhunco and Tullyhaw. 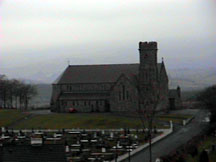 West Bréifne was known as Shieve an Ierin Westwards. The dividing line separating West and East Bréifne is the river Graine, now the Woodford River at Ballyconnell. Lorcan O'Runai in his book "From Rosclogher to Rooskey" list the more well known families of North Leitrim. The rulers of Muintir Kenny were of the family of Mac Con Snamha of Lough Allen. The MacTernans, a Sept of the O'Rourkes, descended from Tighearnan O'Rourke who ruled the land called Teallach Donnchadha anglicized to Tullyhunco a barony in the present Co Cavan, Ulster. See http://mctiernan.com/dnatest.htm for the DNA test of Philip O'Rorke, The O'Ruairc of Bréifne. From the earliest times the Kings of Connacht were inaugurated at Carnfree near Tulsk, Co Roscommon on the plains of Rathcroghan between Strokestown and Elphin in the old Barony of Ballintober. Later on in time, Croghan [Cruachan] was the inauguration site of the kings of Connacht is in Tullyhunco. A close up of all that remains. It is about thirty miles from Sheskin. The great Clan McGovern renowned for religion and learning ruled long and well in their mountain kingdom of Teallach Eachach now Tullyhaw, Co Cavan. The MacDarcy clan ruled Kincluachain which comprised the present parish of Oughteragh at the foot of Slieve an Iarainn in Co Leitrim. The McClancy clan ruled Dartry, the present Barony of Rosclogher in north Leitrim. Drumahaire was the family seat of the O'Rourkes. Drumahaire means "the ridge of the two air demons" and the town in north Leitrim by that name was the seat of O'Rourke's power, called Baile-O'Ruaire or O'Rourke's town. In ancient times, it was called Carraig-Patrick because St. Patrick intended to make it the Ecclesiastical Capital of Ireland but the Saint had a vision telling him to go to the Heights of Maca in Co Armagh, hence today the Italian Prelate of Ireland resides in Co Armagh. Two historical occurrences seem to be prevalent in the area of Drumahaire, one explained and one unexplained. The Drumahaire area is referred to as the area of "The Wild Rose" which comes from the necklace like layers of white and pink dog roses that festoon the local hedgerows in summer. The other unexplained inference is that it is the area of the "Howling Dog". It is not clear what that saying means, what it symbolizes or where it comes from. Four of the eight families in my ancestral line are Irish from Co Leitrim in the Connacht area in the West of Ireland, noted for its stark beauty and made famous by the poet, Yeats. The poet's famous Bulben mountain. The map on the left shows the general location. Almost all known MacTighernan families have their origin in this small part of Ireland. The only other choice other than Connacht was hell as in the famous Cromwellian edict of long ago, "Send them to Connacht or to Hell". Under penalty of death, no Irish man or woman or child was to let himself, herself or itself be found east of the river Shannon, after May 1, 1654. 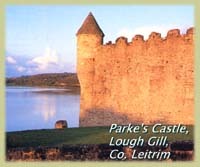 Later in time, Elizabeth I's Plantation effort was mainly in Ulster but also extended as far south as Lough Gill in Co Leitrim, where Parke's Castle sits on the shore. 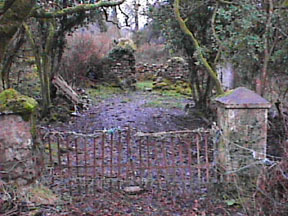 It was built on the earlier remains of an O'Rourke castle. Another view of the O'Rourke castle at Drumahaire. It is written in Irish history, that the McTernans of Bréifne descend from either The O'Ruaircs who were kings of Drumahaire or The O'Conors of north Co Roscommon who were for a time the high kings of all Ireland. The DNA test that 123 of us MacTighernans have taken might prove this or not, 900 years later. The DNA test results of Philip O'Rorke, The O'Ruairc of Bréifne's test matches more or less 17 / 25 to all 20 McTernan DNA groups. Therefore we are unfortunately most likely not genetically related to the O'Ruaircs, at least so far in the test. Undertakers who were to plant their estates with English or Lowland Scots. Servitors who may take native Irish, English or Lowland Scots as tenants. Natives of Ireland who were loyal to the English king. Tullyhunco was set aside for Scottish undertakers. East Breifne, i.e. Co Cavan belonged to Connacht but as soon as the English established some control north of the Pale it was decided that Cavan could be more easily managed if it were annexed to Ulster. Lord Deputy Sussex about 1562 made the recommendation and since that time Co Cavan has been part of Ulster. My family's earliest known McTiernan from the townland of Sheskin is Hugh McTernan I, 1708--1783. Roman numerals have been inserted with each of my family's eight different Hugh McTernans from Sheskin in order to keep them straight. Hugh I is the first known McTernan from Sheskin to be buried in 1783 in the family grave at the foot of the High Altar in the Franciscan Abbey of Creevelea. The Abbey was burned by Cromwell in the mid 1600s and is today an Irish National Historical Site in County Leitrim. It stands on the bank of the Bonnett River across from the town of Drumahaire in the civil parish of Killanummery, Barony of Drumahaire and PLU of Manorhamilton. The earliest gravestone at the Abbey is the one next to the Sheskin McTernan grave, for Hugh O'Rourke and Catherine McTernan buried there on August 22, 1721. A documented connection between our families has not yet been found. Creevelea means "gray branch" in Gaelic. Bishop Edward O'Rourke's of Danzig Poland, 1925, book describes Drumahaire: "nestling among trees on the sunny side of the North Leitrim mountains [Drumlins], in the valley immortalized by Moore, and sheltered from the western blast by Killery mountains, is the ever smiling pretty village of Drumahaire, with its two churches, police barracks, doctors residence, grand lodge, post office, and up-to-date hotel, as chief features of the modern little town. Verging on Lough Gill, it is within five minutes walk of the railway station, and easily accessible from Sligo by splendid roads, both sides of the lake, and formerly by steamer on same. The semi modern, ivy clad castle, with the adjoining picturesque lodge and charming lawn, every variety of sylvan splendor in the view of Hazelwood; the huge natural curiosity, O'Rourke's Table, the indescribable beauty of the lake, its wooded islands and shores are material which proper development and advertisement would entitle the district to be called "the Northern Killarney". Across the river rise the venerable gray walls of the old O'Rourke Franciscan Abbey [Abbey of Creevelea], the resting place of Bishop Thaddaeus O'Rourke, who in days of persecution [18th century] fled from the west for shelter to his friends in Bréifne." Bishop Edward O'Rourke is a descendant of the Irish Earls who left Ireland in the early 1600s in what is known as the Flight of the Earls. He was the Bishop of Danzig, Poland and spoke six languages writing his book in the 1920s on a visit to Drumahaire. Co Leitrim which means "gray ridge" in Gaelic was named after the British Lord Leitrim of Mohill whose Irish residence was on the banks of Lough Rynn. He, unlike some of the British rulers in Ireland was apparently a very bad man, with local folklore telling of his pursuits of the daughters of many an Irish tenant farmer. That deserving reputation, along with high land taxes and evictions led to his murder on a trip to Co Donegal by four Irishmen from County Leitrim on April 2, 1878. When they found the body, Lord Leitrim was clutching the red hair and part of the scalp from one of his attackers. The police thought they had a sure fire way to catch and prove who killed Lord Leitrim. Find the red haired Co Leitrim man with hair and scalp missing and you have the guilty man. Within hours of the start of the search, every red haired Co Leitrim man had missing from his head, both scalp and a hand full of hair. They never were able to prove who killed Lord Leitrim. Talk about joining ranks when the pressure was on. My grandmother, Anne McTiernan, nee McGrail had red hair and a brother, Stephen. Most likely, Stephen may also have had red hair and if so he may have lost a bit of his scalp and hair at this time. The Irish lived along side of the English in Ireland. They, out of necessity had to cope with this interloper and their response to the conflict shaped their character. Their character became their fortune and was shaped by the dynamic interaction of what they thought of themselves and to a like extent what others thought of them. One defined their integrity and the other may well have defined their fate. The lines of battle between British and Irish were most sharply drawn in the administration of justice. The Irish with their strong familial loyalties and ancient Gaelic tribal tradition, were accustomed to appealing to a chieftain to defend their rights. The imported English Common-law system with its juries and its weighing of truth on the basis of individual testimony under oath was alien to them. It seemed scandalous to have to testify against a relative or a neighbor. Oaths of blood or fidelity were one thing but oaths to tell the truth when it was against one's own interest or the interest of a friend were quite another. The claim of abstract justice that it served the common good in the long run held little appeal. In the long run everyone will be dead, and of what use is the common good if it is not also a personal good. With that as a basis and the practical view that the British landlords and courts never had the people at heart left the Irish with only one way to cope. The Irish developed the art of soft deception or Blarney and the disingenuous oath which was not really an oath at all. These were acts of imagination designed to oblige the listener with the fiction of compliance while preserving fidelity to one's own conception of justice. They could not rely on inscrutable silence so they relied on the resources of wit and speech. Under the mask of insinuation, the hearer is induced to believe the speaker has sworn to the fact of the story, as when contradicted "By the stool I'm sitting on . . [it is the truth!] " but the oath is never fully stated. Behind the sifting faces of the national character, flowing within every manifestation of the national Irish spirit was a pervasive, inescapable mirth. The Irish, no matter what outsiders thought never took themselves too seriously. Supreme egotism and utter seriousness are necessary for the greatest accomplishments, and these are difficult for the Irish to sustain. At some point the instinct to see life in a comic light becomes irresistible and ambition falls before it. A certain gaiety stands always available to the Irish to turn the tables on life when needed. Early on, Ireland seems to have evolved differently in two major ways. The right of primogeniture was never used, rather the passing of land or family assets from generation to generation was done to all the sons, not just to the eldest as it was in the rest of Europe. The historical formula for development seems to be that trade produces wealth, wealth pays for knowledge and knowledge stimulates more trade. The second major difference was that the trade part of the formula never seemed to get going in Ireland to the extent that it did in many cultures in Europe. Lack of the old Roman roads may have been one of the major root causes. Michael McTiernan, 1864--1937, the oldest, at around twenty eight immigrated to New Farm, Brisbane, QLD, Australia c. 1892 and married Ann Bridget McMorrow. This McTiernan line married into the Australian families of Watson and Blake. Hugh McTiernan VI, 1866--1944, at twenty nine, married Anne McGreal in the Killargue parish chapel and immigrated to America in 1895 settling in St. Louis, MO and then his descendent in Wayne-Strafford, PA, USA. My McTiernan family also married into the Silvy family from Kentucky without issue. Patrick McTernan, 1869--c.1900, verbal family history says he worked as a clerk in a shop in the County Leitrim town of Carrick-on-the-Shannon and then joined the British Army around 1900, leaving Ireland to fight and die in one of England's many wars somewhere in the Empire. Jane Mary McTernan, 1872--1872, died soon after birth. John McTernan, 1874--1949, stayed on the family farm in Sheskin and married Ellen Woods. Their two daughters immigrated to England right after World War II and settled in Coventry, West Midlands marrying the two Flynn brothers. This McTiernan line married into the British families of Flynn, Bower, Lane and Dunne. The Eyre Bower family is linked to the historical family of Jane Eyre. The Bower family can trace their line back to England's Doomsday Book in the 1100s. John and Ellen's son, Hugh McTernan VIII, 1916--2006, was born on Sheskin and lived there until right after World War II then lived in Toothfield outside of Manorhamilton, Co. Leitrim until he passed. Lord Hamilton had invited the local chiefs to dine at his castle with the intention of killing them while they ate. As the time approached for the servants to do the deed, the old Irish piper providing the music for the feast played the song, "Make your visits short and far between". Too busy eating to notice, the local chiefs were killed. Lord Hamilton and his castle fell in 1652 when attacked by the Royalist Clanricard and Owen Roe O'Neill. As per Lorcan O'Runai in his book "From Rosclougher to Rooskey": Lord Hamilton escaped from his castle hiding in a group of women released by Owen. It is said that he shed tears as he paused on horseback to take a last look at his castle in flames. The ten generation chart with the extended McTernan / McTiernan family from the townland of Sheskin, Barony of Drumahaire with photos of all four McTernan lines, Irish, American, British and the Australians. The multi-generation charts for the McGrail, Byrne and Carney families. In the late 19th century, Hugh McTernan V, Mary Carney and their four sons lived in a two room rock walled house 11 feet wide by 35 feet big on about 47 acres of land in Sheskin with no cattle fences, just the gates of Sheskin. Looking at the house in 2008 it appears that there were 3 separate rooms, the bigger one was the family kitchen with a firsplace and most likely where the parents slept. The other two rooms are smaller, the one one the far end looks to small to hold humans and most likely was the stable for horses or cattle. The room between the small stable and the family room could sleep four young men. That room would have been warm in the cold winter night as it would be between the enclosed stable and the wall that held the stone firplace in the family room. Looking from the road at the house these 2 additional rooms would have been to the left. Additionally a second house is to the rear and about 20 feet off to the left of the main house. This is where Ellen McTiernan and her cousin James McTiernan resided. Ellen was most likely the sister of Bernard McTiernan the editor of the Sligo Champion. 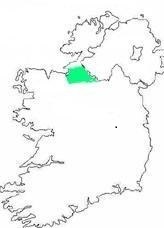 The 1981 population of Connacht was 424,000. The previous chart shows the townland of Drumrewy or Drumrewey, located immediately north of St. Brigid's in Drumkeeran as having the highest quality land with Sheskin, the poorest. Sheskin in 1841 was the 4th smallest townland in Killargue Catholic parish in terms of population. The famine which led to death or emigration seems to have hit Lisfuiltaghan and Drumrewey the hardest. The Carney farm of 88 acres is right on a lake that is currently famous for its Perch fishing which might have offset the impact of the famine on the residents of the townland Carrigeencor to some degree. My great grandparents, Hugh McTernan V, Mary Carney, Bartley McGrail Jr. and Mary Byrne were our ancestors that lived through the famine. The parish of Killargue has 75 townlands, Inishmagrath (Drumkeeran) has 138 and Drumlease (Drumahaire) has 47. During the famine years of 1845-1851 Ireland lost some 2,225,000 people. The mortality rate in Co Leitrim was 43 per 1000 people. Sligo was even worse. Leitrim largely escaped the Viking raids between 874 and 950 and was one of a handful of counties that escaped the 12th century Norman invasion. Subsequently, however it was one of the first to be settled by the English in the 1600s. That meant that the old Irish feudal system and traditions continued in Leitrim far longer than in other counties but then disappeared much quicker with the arrival of English settlers. The significant social, economic and political shifts that took place during the mid nineteenth century thus had their roots in the changing patterns of land ownership and society in the centuries and decades before. In South Leitrim from the mid 1500s, the clan way of life was under serious threat. An increasingly powerful English administration was slowly but surely extending its influence and dominion. In a visit to Mohill in 1540, the Saxons destroyed the monastery and beheaded the guardian and several of the friars. By 1590, the English government ; forces were actively routing the local clans. The first major failure of the potato crop occurred in 1816 when Peel, later the Prime Minister, was Chief Secretary for Ireland. The crop failed again in 1817 causing a near famine which was accompanied by an outbreak of typhus. Further serious food shortages occurred between 1822 and 1826. It was the laboring class that would be most affected by the Great Famine as they had nothing. They existed season to season in tiny mud cabins on a patch of land that they leased under a system called "conacre". Under conacre they were given a plot for a single season in exchange for casual labor and / or rent. The reality of life during the famine times was emigrate or starve. While this writing is not meant to be an Irish "Keen" none the less, as the coffin ships made their slow voyage across the Atlantic it was said by men who had experienced both that the coffin ships transcended in horror the middle passage of the slave trade. The coffin ships carried a cargo of hatred. In the new world, that had been called into being to redress the imbalance of the old, there was to grow up a population among whom animosity to England was a religion, a creed, whose burning resentment could never be appeased, who, possessing the long memory of Ireland, could never forget. The Irish famine was to be paid for by England at a terrible price; out of it was born Irish America. Hugh McTernan V was about nine or ten at the start of the great Famine. Mary would have been born the year before the famine. Now after surviving that, forty six years later there must have been a very sad family meeting about 1891. Imagine Hugh V and Mary and their sons sitting on the mud floor of their home, explaining to their four sons that all they had was 47 acres with a few cows and that was not enough to leave four sons. Three of the sons would have go off to make their way in the world, as without land and cows you could not marry and hope to support a family. At this assumed meeting c.1891, Michael was 27, Hugh VI was 25, Patrick was 22 and John was 17. The oldest three sons left between c. 1892 and c. 1900, with Michael being first going to Australia, Hugh VI second going to America and Patrick the last to leave, joining the British Army. John the youngest, stayed on Sheskin. A very defining moment in our Irish family history. This web page shows the distance from the four townlands to each other and local sites. The men in the four Irish families apparently were really smart. Not only did they pick the best looking girls in the area but they lived within eight or nine miles of them. So after a hard day working in the fields tending cows it was not too exhausting to walk seven or eight miles to see her. Throughout McTiernan history our name is spelled with and without the letter "i", sometimes Mac instead of Mc. The American's and the Australian's added the "i" while in Ireland it was left out. As in most cases in Ireland, the family surname is spelled in different ways. Additional links to Irish Home Pages: the 1790 paper on Defenderism in County Leitrim, Elishimorta, being the Defender's password. German and French village maps are also included. The potato was very important, as one of the underlying major causes of emigration for all eight families. In 1752, during Hugh McTernan II's lifetime, the calendar was changed dropping 11 days during September and 11 people were killed in riots in London as they thought companies were going to cheat them out of 11 days pay. In the Liverpool riots many people died as they believed their lives shortened. This is . . . . .
Nearly one and three quarters of a century has passed since revolutionary tremors began to shake down the worm eaten structure of the European empires. In this time, events have taken on the glaze if icons. Our immigrant ancestors somehow gleam in the histories like varnished frescoes, to me they are heroic in scope turned into gods or perhaps devils but never just mere mortals. Two of my eight families are German, one is French and one is of the Hapsburg-Austrian Empire. These four families all immigrated separately to America between 1848 and 1856. Later in history about 1918 well after the Lucash family emigrated, Prague reverted from Bohemia, Hapsburg-Austrian Empire to Bohemia, Czechoslovakia. If you draw a horizontal line right through the middle of Germany and Bohemia, our ancestors lived below that line and their language was therefore high German. The German family names of Fries and Bender seem to have just one spelling but the Lucash and our French family name of Blaies are spelled differently throughout history. The Lucash name is spelled Lukáše in Bohemia. The s in Lukáše has a scaron accent mark that I cannot duplicate in html. It is a figure < directly over the "s" but pointed down not to the left. The American, Nicholas Blaes and his descendants in America have dropped the letter "i" from the original Blaies name. The four European families are connected as follows: Konradius Fries, 1834--1897 married Barbara Lucash, 1840--1924. Their son, Adolph Fries, 1879--1945, married Anne Blaies, 1879--1948. Anne's parents were Jean Michael Blaies, 1822--1902 and Theresia Bender, 1833--1898. Adolph Fries, 1879--1945 and Anne Blaies, 1879--1948, my maternal grandparents were married (photo) at St. Peter's in Belleville, St. Clair Co, IL in 1900. The European side is connected to the Irish side via my mother, Florence Fries, 1911--2000, the daughter of Adolph Fries and Anne Blaies, the grand daughter of Theresa Bender and Barbara Lucash. Florence or Flo as Mickey called her married John [Mickey] McTiernan, 1901--1989 on October 5, 1940 in St. Louis, MO. The deep history of these four European families goes back over 450 years, fifteen generations to the first half of the 16th century, to c. 1545. The earliest known maternal Fries ancestor, Michael Eck, c.1545--, was born about ninety years or three generations after the end of the Middle Ages. The Byzantine Empire founded by Constantine the Great in 330 AD was defeated at Constantinople by the Turks on May 29, 1453. The defeat of the Byzantine Empire is viewed historically as marking the end of that empire and the end of the Middle Ages. During those 450 years, one or more of our four families lived under French, German, Swedish, Hapsburg-Austrian Empire and American rule. Our early European ancestors had to deal with Charles XII of Sweden who conquered and ruled much of Europe during the 1600s. All of our four families emigrated from Germany, the Hapsburg-Austrian Empire and France to America between 1848 and 1856. One of two ancestors from our Bender family, Juliana Viktoria Reiss, nee Metzger, my generation's 6th cousin two generations removed immigrated to South America in 1852. Other Bender ancestors immigrated North to Russia and East to Serbia. Our Bender family has more historical information than do the other three families from Europe with an extraordinary amount of history on our ancestors, twelve of which served and were wounded or killed in Russia in Napoleon's invasion of that country. This is based on the great deal of information that Judy Lindenfelser found on our Bender ancestors, over 200 of whom played a part in the history of all the great German wars starting with Napoleon's invasion. One of the historical ironies of life is that several of our Bender ancestors died invading Russia helping at least to write the military history of Europe. Way back in the early days all invading armies had to wait till the grass had come up in late spring before they started their invasion de jour. Said a different way, no grass no horse, no horse no calvary, no calvary no army. Calvary was the eyes and ears of any invading army and were needed to know what you were getting into. Obviously a calvary man rides a horse and in order for his horse to eat they had to wait for the grass to start growing. This meant that every invading army on the way into Russia came through just when you were doing the spring planting which would see you through the following winter. In the fall at harvest time that invading army was returning from the invasion before the grass died and therefore their horses. The farmer, our Bender ancestor was trying to plant and harvest crops while this was going on all around him. One stressful job. This grass / horse problem is one reason why the invading Huns who invaded from the east never got past Vienna further into western Europe. They were a horse people that ran out of time. When the grass started to die in the fall they turned around and went home till the following year. Russia early on had figured out the code which was that all invading armies intend to live off the land as they invade not only for their horses but for the soldiers also. Sort of fight and eat as you go. Russia invented the scorched earth policy on a large scale. As an army invades, everyone runs and hides but before they do they set fire to everything including pasture and crops. 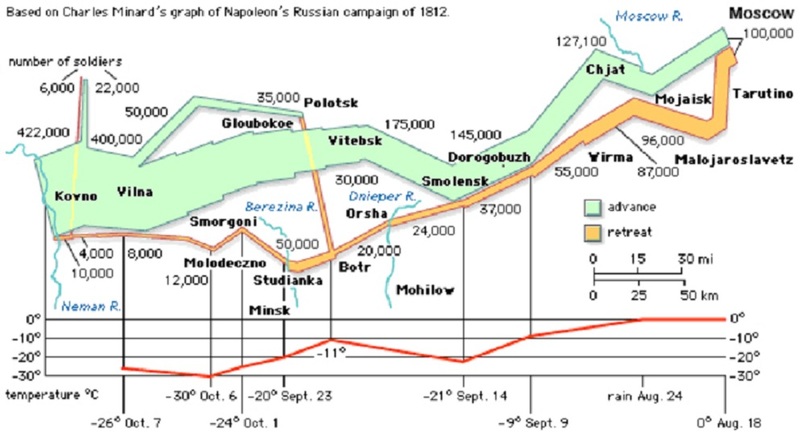 So the invading army ends up neither fighting nor eating for some 2000 miles and the famous Don Cossacks attack the 2000 mile long supply line. Hence the lesson for Napoleon invading Russia with 500,000 men and getting out with only 85,000 men. One hard lesson but the Germans also made the same mistake as did Charles XII of Sweden in his invasion that pre dates Napoleon. The final destinations in America for all our emigrant ancestors from Europe are known except four of the Fries family, Georgius Michael Fries, 1793-->1848, his wife Cristina Deppisch and two of the Fries' daughters. While the records show them leaving Germany in 1848, there is no trace of them in America or Illinois as yet. Georgius and Cristina Fries' other three children, Marie Whitmeier, nee Fries, Konradius Fries and Justine Becker, nee Fries settled in Belleville, Illinois. As of 2002, the Fries paternal line goes back for thirteen generations to 1580. The Fries maternal line goes back fourteen generations to c. 1545. The Lucash family line goes back nine generations to c. 1763 on the paternal side and 10 generations on the maternal side. The Blaies paternal family line goes back 12 generations to c. 1645 and the maternal Blaies line goes back fourteen generations to c. 1595. The Bender family history goes back 15 generations, to c. 1585. While most of our European ancestors were farmers, some were inn keepers, shoemakers, town judges, smiths, day laborers, Mayors, Postmasters and one was a horse trader. A few died of the black plague and several were killed in the many European wars. Four of our immigrant ancestors fought in the Union Army in the American Civil War. None of our ancestors fought with the Confederacy. 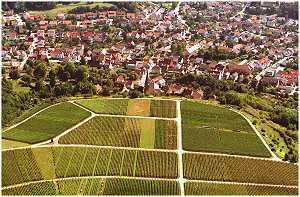 The Fries family came from Bavaria, from the village of Strüth in the parish of Röttingen, about fifteen miles south of the city of Würzburg, Bavaria. Before immigrating to Belleville, IL in 1848, the Fries family first moved about twenty miles from Strüth, Bavaria to Kützbrunn, Baden and stayed for several generations. The Lucash family came from the area of Prague, specifically the nearby village of Manetin, Bohemia, Hapsburg-Austrian Empire leaving in 1852 and arriving in Freeburg, IL in 1853. The Blaies family emigrated from the village of Petit-Tenquin and Diffembach before that, in the parish of Hellimer, thirty miles from the city of Metz in the state (department) of Moselle, in the Lorraine region of NE France. Immigrating in 1852 first to the Arnold, MO area then to Mascoutah, IL in 1864. 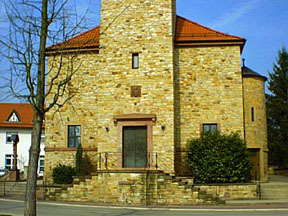 The Bender family came from Baden, Germany, from the village of Rettigheim in the parish of Malsch, about fifteen miles south of Hiedelberg. The family first resettled about seven miles from Rettigheim, Baden to the village of Mühlhausen, ; Baden before emigrating to the St. Louis, MO area between 1848 and 1856 and then to the Mascoutah and O'Fallon, IL area. Others in our Bender line settled in the Highland, IL area. On the my maternal European side I descend from Tara, more specifically the subgroup T4, who was one of the 7 European daughters of Eve. Even though I am a male McTiernan, my mother was a Fries and her mother was a Blaies and her mother was a Bender so I have their mtDNA but my children would not. The mtDNA is passed down maternally not paternally so they would have their mother's mtDNA not mine. This maternal mtDNA tracking is explained at http://mctiernan.com/mtdna.htm. Traveling from Europe to America, never having seen the ocean should have been quite a thrill. 2.1.2.2.3.1.1.1. Elisabeth Fellhauer, nee Förderer holds the known record taking 96 days to cross the Atlantic in 1846. Our European ancestors arrived in America right before the start of the Civil War. They only spoke German and French and most likely were very nervous about their neighbor, Abe Lincoln living down the road in Springfield, IL talking about war. Members of the Lucash, Blaies, Bender and Fries families fought in the American Civil War on the side of the Union. Jean Michel Blaies, 1823--1902, was a 2nd Lieutenant in Company H, in the 80th Regiment of the Enrolled Missouri Militia of Jefferson County, Missouri. His brother-in-law, Wendel Bender was a 1st Lieutenant in the same Army unit. John Lucash Sr. 1844--1925, fought in Co. "G", 43rd Reg't, Illinois Infantry. Konradus Fries, 1834--1897, was a private in Company B, 149th Illinois Infantry and was discharged in Dalton, GA. He died at the Soldiers and Sailor's Home in Quincy, IL. His great grandson [myself] went to college for four years and graduated from Quincy University in Quincy, IL sixty eight years later without knowing at the time that he died there. The European political upheaval of 1848 was most likely one of the major root cause of our European ancestor's emigration. Their known life in Europe seems to be a less romantic one and was most likely a harder game to survive than my Irish ancestors had. The Europeans had to plow, plant and harvest crops to eat as well as keep an eye out for this years invading army while the Irish had to watch the cows, get the milk and watch the British army. All our European ancestors came over between 1848 and 1856 ending up in the greater St. Louis, Missouri and East St. Louis, Illinois area. In 1890, St. Louis was the 4th largest city in America. NYC, Chicago and Philadelphia were the first three. That general area had about 10 % of the German population of the United States. The German social structure at the time dictated that the Germans arriving after 1848 were called "The Greens" and the ones arriving before 1848 were called "The Grays." Our two German ancestor lines were part of "The Greens". Most were very anti slavery and on the side of the Republicans at the time. 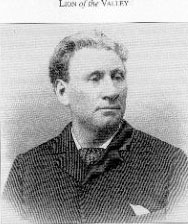 Jean Michel Blaies, 1823--1902, our French ancestor, may have changed his first name to Mickael due to the extensive German influence in the St. Louis, MO and St. Claire Co, IL area. Mickael's daughter, my grandmother Anne Fries, nee Blaies, spoke German at home to her husband, Adolph Fries when they did not want the kids to know what they were talking about. All of the family Arms used in the separate histories belong to that specific family name. Each Coat of Arms and Crest is from the same general geographic area as one of my eight families except the Lucash family Coat of Arms and Crest which family seat is located in the Ukraine. With the exception of the Sheskin McTernan Armorial Arms, as yet, no valid connection or possession via the right of Armiger has been made between any of my family and any of the other seven Armorial Coat of Arms or Crests. The 16 Great Great Great Grandparents of my two children. In St. Louis, my family like many Irish went into politics. Lincoln Steffens devoted a whole chapter in his 1904 book, "Shame of the Cities" to the St. Louis political machine run by Ed Butler called "the combine". The immigrant Irish politician found the poor their best audience. They had two characteristics that were needed at the time. First they would listen and second they would vote often. Usually in St. Louis politics that meant several times in the same election. While my eight immigrant families may have been mostly concerned about where their next meal was coming from and how to survive in a new country, the age old question in Gaelic, Arbh fiu aithne air no uuirth? [Was he or she worth knowing?] has been answered by their accomplishments, what they have lived through, the obstacles they overcame and a clear understanding of what they left us, echoing down the wind. The other question is what might the future hold for the descendants of the 8 families? What events might be in store for us, our children and our grandchildren? The natives in Africa have a great saying when someone asks them what might happen in the future, as in: When will the rains come or when will the hunting be better? They always reply to this type of open ended unanswerable question with this phrase passed down for centuries, "Any time from now". This abstract is made available to further any effort to find historical information on any of the eight families. If you think you are connected directly or by marriage please Email me and I will send you a hard copy of the full history. This is a hobby with me so there is no cost to you. I would hope you would share any information on any individuals in our family that you might have. If you would like a link to your web home page from mine please let me know. Many individuals have helped me in gathering the information on all the family histories. Bridget Sullivan of the Leitrim Heritage Centre in Ballinamore, County Leitrim was especially helpful on the Irish side. The 5 inch history of the Bender family is only possible due to Judy Linnenfelser efforts. Below are home page links to other Web sites that have great information to help in the search. The new Y chromosome DNA test shows 123 MacTighernans in 20 different genetic groups or septs from 11 countries and 5 continents with almost all originating from the Co Leitrim, Co Sligo and Co Cavan area. Eoghan McTiernan's extensive family web site is at http://www.e.mctiernan.btinternet.co.uk/Welcome.html who is in the baseline of the T3 DNA group. The maternal mtDNA test results showing maternal descent from Tara, more specifically the T4 subgroup, one of the 7 Daughters of Eve. List of MacTighernans and townlands from the 1847 - 1864 Griffith's Evaluations . A listing of McTernan / Carney / Byrne graves in and around Killargue and the Barony of Drumahaire. Greg McGrail's web page, my 3rd cousin one generation removed. A map of the townland of Lisfuiltaghan, origins of my McGrail family. Sites around and nearby Co Leitrim. Remarkable site. A searchable Data Base, of British Irish war dead in The Great War and W.W.II. A great new web site courtesy of John Hunter: http://www.geograph.org.uk/explore/places/2/ie-14/ that offers photos of Ireland taken by anyone. Oscar Wilde's last words on his death bed a minute before he died in a flea bag hotel in Paris were, "Either the wallpaper goes or I do". He left and the wall paper stayed. Others like us, looking . . . .
Searching for links and Web pages to other McTiernan / McTernan families ? Searching for links and Web pages to other Carney / Kearney families ? Searching for links and Web pages to other McGreal / McGrail families ? Searching for links and Web pages to other Beirne / Bryne / Byrne families ? Searching for links and Web pages to other Fries families ? Searching for links and Web pages to other Lucash families ? Searching for links and Web pages to other Blaies / Blaes families ? Searching for links and Web pages to other Bender families ?